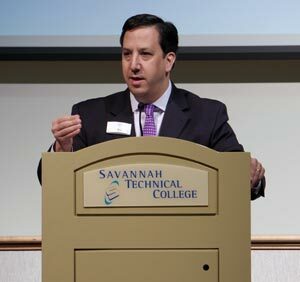 The 2016 Savannah Critical Issues Forum on the Business of Film and TV Production took place on Thursday, February 25 at the Savannah Technical College Eckburg Auditorium. An audience of 150 local business, community, and film industry leaders heard panelists prominently involved in diverse aspects of the Georgia film economy address the growth, challenges, and opportunities associated with film and TV production in the Savannah area. Moderated by HunterMaclean partner Shawn Kachmar, the panel included Stratton Leopold, Producer; Lee Thomas, deputy commissioner of Georgia Film, Music & Digital Entertainment Office; Hugh “Trip” Tollison, President and CEO of Savannah Economic Development Authority; Beth Nelson, Interim Director of Savannah Film Office; and Bass Hampton, Location Manager. Governor Nathan Deal recently noted that with the implementation of the Georgia Production Incentives, the film industry now employs nearly 80,000 Georgia residents and has an annual economic impact of $6 billion dollars. Film Savannah reports that in 2015, more than $58 million was spent by entertainment productions in Chatham County. Georgia is now ranked third in the nation for film production. The HunterMaclean Critical Issues Forum is an annual speaker series launched in 2004 that invites speakers to address an issue of importance to the community. This year’s event was held in partnership with the Savannah Economic Development Authority (SEDA), which has recently announced Savannah Entertainment Production Incentives to draw additional film and television productions to the Coastal Empire. A feature story on the Critical Issues Forum and the boom in local production appeared in the Savannah Morning News: Showtime in Savannah.